Amazing, but of all my past vehicles possibly the *only* one I can say I *truly* miss! Knowing almost nothing about them, I drove out to one of the bigger Toyota dealers in NJ to have a look. What I found is that they all seemed to have a white roof! It was then that I spotted one, tucked way in the back and left filthy and unloved, that did not have a white roof. This ones roof was black! I squeezed my way past probably 100 Corollas and looked at her close up. I knew she was the one. The sales guy seemed unhappy. Thirty minutes later, after he had played automotive Tetris and gotten her out, I learned that she was actually a special TRD Limited Edition; one of only 4800 or so units. So why was she left filthy and discarded behind a veritable wall of run of the mill Corollas? That is a fantastic question. My guess is that possibly one of the employees was hoping to stack the deck a bit, and take her home himself if she sat long enough to get cleared out. If that was the case, I shattered that plan. I ended up making an offer and driving her home that day! Sometimes you just know. The FJ oozes design charm. Possibly a polarizing charm, but charm nonetheless. Personally, I love it. To my eye it screams “modern FJ40” and the FJ40 was an epic vehicle. Everything about the FJ looks rugged and tough. Inside, the addition of the TRD package created an interior that was basically combat ready. Removable neoprene seats combined with a solid high impact plastic floor and special edition heavy gauge rubber TRD logo mats. The entire thing could be hosed out to clean it. An awesome touch for real off roaders. The dash design was retro inspired as well with big round gauges, but also supremely functional with compass, inclinometer, and thermometer in a central dedicated pod. The entire feel was purpose built and ready for business rather than styled for some specific aesthetic. The front seats were incredibly roomy and comfortable with a fantastic view out the huge front window. The back seats, not so much. A concession to the awesome retro-chic exterior, complete with suicide doors, was that the back felt a bit claustrophobic. The seats were reasonably roomy, but the windows were just small portals and the rear suicides were just half doors. Rear passengers often indicated that they felt a bit “sealed in”. The TRD Limited Package adds fantastic exterior visual cues as well, in the form of special gunmetal wheels, massive BFG offroad tires, and rock guards all around, and adds functionality in the form of Bilstein off road shocks, and a locking center differential (yes, the FJ Cruiser is a true, mechanical, 4WD system with a mechanical center diff, rather than a full-time AWD system with a viscous central coupling). The build quality was superb. The FJ felt like a tank and everything was built to take a ton of abuse and stand up to it. In the 5 years and 67,000 miles I owned her (longer than any of my other vehicle), she stayed looking new both inside and out and that’s after road trips to Toronto during the Canadian winter and central Florida at the height of summer. Unlike the Freelander, the FJ is a body on frame truck, but actually doesn’t quite drive like one. It is much faster than you’d expect (managing to rocket to 60 in less than 7 thunderous seconds thanks to a beefy V6), and actually has half way decent handling. It is still a massive, heavy, vehicle, however, so it’s no corner carver. Brakes were excellent and stopped the big truck well and with good feel in all weather conditions (within reason of course), and the shocks and suspension had genuine off road capability while still being livable day to day. As a highway cruiser she was comfortable and wonderfully capable if a bit loud. This was partially due to the big off road rubber and partially due to the awesome TRD sport exhaust that is also a part of the Limited Edition package. As I said, I put more miles on the FJ than any other vehicle and miss her to this day. That’s saying a lot considering the vehicles I’ve owned. When it came to bad weather, if the Freelander was tough, the FJ was unstoppable. The truck had far more off road capability than I had confidence, and it would take a serious amount of snow to defeat the combination of low gear, mechanical 4WD, off road Bilsteins, and those massive BFG tires. In 67,000 miles the only thing the FJ ever needed was wear and tear items and regular maintenance. At the time I sold her I was on the original shocks and tires with plenty of life left, and on my second set of brakes (all corners). Oil changes were done every 3000, with the filter getting swapped at the same time, and the cabin filter was done on schedule. I tend to follow the manufacturer schedules for all of my cars and the FJ was no exception. Keeping the tradition started with the Freelander I did do some modification to the FJ as well. Having located a great fellow owner on the FJ Cruiser forums who was looking to swap the Toyota FJ side step for the standard rock rails that came with the limited edition, I drove down to DC to do the trade. It turned out to be a great day as we performed the swap right in his driveway and he also lent me a hand in mounting a bull guard to the front end. Every real truck needs armor! What can I really add? I only sold the FJ because it was too big for my wife to drive and the kid was starting to complain about the back seat (as they get older, they develop opinions!) 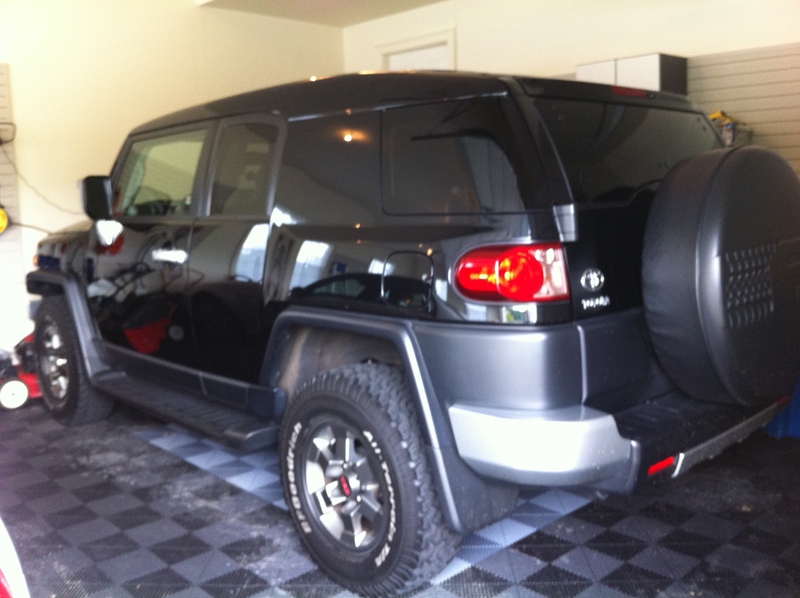 Similar to the NSX, given unlimited room and funds, I would always find a spot in the garage for an FJ!